The region of the Arches cluster seen in X-rays (contours) and in the near infrared (background image). The infrared map is obtained from observations by the Hubble space telescope at the 1.875 µm wavelength (data taken from Dong et al. 2011, Monthly Notices of the Royal Astronomical Society, 417, 114). 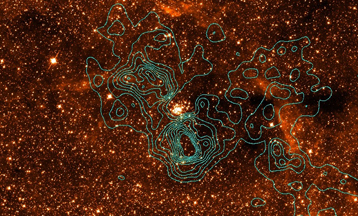 The contours show the strength of the neutral iron line observed by XMM-Newton around the star cluster (located in the center of the image). The X-ray emission is produced by cosmic rays accelerated in the shock wave formed in the interstellar medium by the supersonic motion of the cluster. In the image, the cluster is traveling from right to left at about 700 000 km/h. Photo credits V. Tatischeff. Scientists using the XMM-Newton X-ray astronomy satellite discovered a new signature of a source of low-energy hadronic cosmic rays in the vicinity of the Arches cluster. Using the European X-ray astronomy satellite XMM-Newton(1), researchers from CNRS(2) and CEA (3) have discovered a new source of cosmic rays. In the vicinity of the remarkable Arches cluster, near the center of the Milky Way, these particles are accelerated in the shock wave generated by tens of thousands of young stars moving at a speed of around 700,000 km/h. These cosmic rays produce a characteristic X-ray emission by interacting with the atoms in the surrounding gas. Their origin differs from that of the cosmic rays discovered exactly a hundred years ago by Victor Hess, which originate in the explosions of supernovae. The findings are published in the journal Astronomy & Astrophysics. A hundred years ago, the Austrian physicist Victor Franz Hess discovered the existence of ionizing radiation of extraterrestrial origin, which he called cosmic rays. Today, their nature is well understood. When certain stars at the end of their lives explode and become supernovae, their matter is ejected at supersonic speed, generating shock waves that accelerate the particles. As a result, some atomic nuclei gain very high kinetic energy and enter the Earth’s atmosphere. However, low-energy cosmic rays(4) are not detected in the region of our planet, since the solar wind prevents them from entering the heliosphere. Little is therefore known about their chemical composition and flux outside the Solar System, although everything suggests they play a significant role in the Galaxy. For instance, by ionizing and heating the densest interstellar clouds, they probably regulate the formation of stars. The authors of the article began by studying the X-ray emission that should theoretically be generated by low-energy cosmic rays in the interstellar medium. They then looked for signs of this theoretical emission in X-ray data collected by XMM-Newton since its launch in 1999. By analyzing the properties of the X-ray emission of interstellar iron recorded by the satellite, they found the signatures of a large fast ion population in the vicinity of the Arches cluster, about one hundred light-years from the center of the Milky Way. The stars in this cluster are traveling together at a speed of approximately 700,000 km/h. The cosmic rays are in all likelihood produced in the high-speed collision of the star cluster with a gas cloud in its path. In this particular region, the energy density of the accelerated ions is around a thousand times greater than that of cosmic rays in the neighborhood of the Solar System. This is the first time that a major source of low-energy cosmic rays(5) has been discovered outside the Solar System. It shows that the shock waves of supernovae are not the only objects that can cause mass acceleration of atomic nuclei in the Galaxy. These findings should make it possible to identify new sources of ions in the interstellar medium, and may lead to a better understanding of the effects of these energetic particles on star formation. (1) XMM-Newton is an ESA satellite to which CNES, CEA and CNRS have made a significant contribution. (2) Laboratories involved: Centre de Spectrométrie Nucléaire et de Spectrométrie de Masse (CNRS/Université Paris-Sud), Laboratoire d’Annecy le Vieux de Physique des Particules (CNRS/Université de Savoie), Laboratoire Astrophysique, Interactions, Multi-échelles (CEA/CNRS/Université Paris-Diderot). (3) Institut de Recherches sur les Lois Fondamentales de l’Univers (Irfu), Service d’astrophysique. (4) Cosmic rays whose kinetic energy is less than half a billion electronvolts. (5) The cosmic rays discovered are hadronic, in other words largely made up of atomic nuclei. Hadronic cosmic rays make up about 99% of the galactic particles detected in the vicinity of the Earth. Electrons and positrons, which make up the leptonic component of cosmic rays, are far less abundant. 2 Comments on "Scientists Discover a New Type of Cosmic Ray"
The report says that clusters of young stars moving at a speed of 700000km/h throws out neutral atoms synthesized by those stars even like iron atoms are flying in contours and emitting X-rays by their interaction with solar like winds. These low energy cosmic rays are a difficult discovery indeed which speaks of the particle rain from the space. High energy cosmic rays were found by us already in the discovery of electron-positron pair production from the highly powerful gamma rays. The entire COSMIC RAIN consists of, solar winds of ions, leptons, gamma rays and even other heavy hadrons like iron atoms sweeping the sky. The cosmic rain is from all directions and its complexion only differs by their origin . Thank You.